WikiLeaks founder Julian Assange has been denied bail by a judge after surrendering to British authorities over a Swedish arrest warrant Thursday. Assange vowed in court to fight extradition to Sweden, where authorities are hoping to question him over a sexual molestation case. 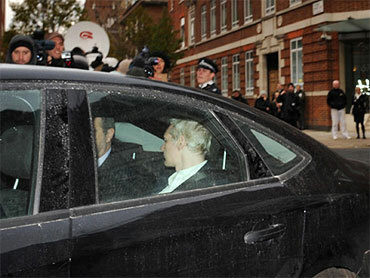 Assange was arrested at 9:30 a.m local time Tuesday and appeared before Westminster Magistrate's Court. He surrendered Tuesday under an agreement reached between his own lawyers and the police. CBS News correspondent Elizabeth Palmer reports Secretary of Defense Robert Gates, who was touring a U.S. base in Afghanistan, looked pleased when told of Assange's arrest. "I haven't heard that, but that sounds like good news to me," said Gates. Judge Howard Riddle told Assange that he had "substantial grounds" to believe the 39-year-old Australian wouldn't turn up for subsequent proceedings. He then put Assange into U.K. custody ahead of an extradition hearing. District Judge Howard Riddle refused the WikiLeaks founder bail because Swedish authorities had presented "serious allegations against someone who has comparatively weak community ties in this country and the means and ability to abscond," reports the British daily, the Guardian. He rejected the prosecution claim that bail should be rejected on the grounds of Assange's safety. Meanwhile, a spokesman for WikiLeaks called Assange's arrest an attack on media freedom and said it won't prevent the organization from releasing more secret documents. "This will not change our operation," Kristinn Hrafnsson told The Associated Press. The WikiLeaks website, which has been bumped off two U.S. companies' servers, remained online Tuesday via a Swiss domain name provider. No new U.S. diplomatic cables appeared on the site Tuesday, but it wasn't clear whether that was related to Assange's arrest. Palmer reported last week that Assange and his colleagues at WikiLeaks had put in place a back-up plan to prepare for the event of his arrested or the site being completely disabled. Supporters of WikiLeaks around the world have downloaded a file the site calls an insurance policy, Palmer reported. The files are encrypted with a code so strong it's unbreakable, even by governments. If anything happens to Assange or the website, the plan was for a key to go out to unlock the files. There would theoretically be no way to stop the information from spreading like wildfire, because so many people already have copies. It was unclear Tuesday whether Assange's surrender would prompt WikiLeaks to distribute the key to the encrypted file, but Hrafnsson's reaction Tuesday morning made it seem unlikely. The pressure on WikiLeaks mounted from other quarters Monday: Swiss authorities closed Assange's bank account, depriving him of a key fundraising tool. And WikiLeaks struggled to stay online despite more hacker attacks and resistance from world governments, receiving help from computer-savvy advocates who have set up hundreds of "mirrors" - or carbon-copy websites - around the world. In one of its most sensitive disclosures yet, WikiLeaks released on Sunday a secret 2009 diplomatic cable listing sites around the world that the U.S. considers critical to its security. The locations include undersea communications lines, mines, food suppliers, manufacturers of weapons components, and vaccine factories. Pentagon spokesman Col. David Lapan called the disclosure damaging and said it gives valuable information to the nation's enemies. "This is one of many reasons why we believe WikiLeaks' actions are irresponsible and dangerous," Lapan said. WikiLeaks has been under intense international scrutiny over its disclosure of a mountain of classified U.S. cables that have embarrassed Washington and other governments. U.S. officials have been putting pressure on WikiLeaks and those who help it, and is investigating whether Assange can be prosecuted under espionage law. For days, WikiLeaks has been forced by governments, hackers and companies to move from one website to another. WikiLeaks is now relying on a Swedish host. But WikiLeaks' Swedish servers were crippled after coming under suspected attack again Monday, the latest in a series of such assaults. It was not clear who was organizing the attacks. WikiLeaks has blamed previous ones on intelligence forces in the U.S. and elsewhere. WikiLeaks' huge online following of tech-savvy young people has pitched in, setting up more than 500 mirrors. "There is a whole new generation, digital natives, born with the Internet, that understands the freedom of communication," said Pascal Gloor, vice president of the Swiss Pirate Party, whose Swiss Web address, wikileaks.ch, has been serving as a mainstay for WikiLeaks traffic. "It's not a left-right thing anymore. It's a generational thing between the politicians who don't understand that it's too late for them to regulate the Internet and the young who use technology every day." Meanwhile, the Swiss postal system's financial arm, Postfinance, shut down a bank account set up by Assange to receive donations after the agency determined that he provided false information regarding his place of residence in opening the account. Assange had listed his lawyer's address in Geneva. "He will get his money back," Postfinance spokesman Alex Josty said. "We just close the account." Assange's lawyers said the account contained about $41,000. Over the weekend, the online payment service PayPal cut off WikiLeaks and, according to Assange's lawyers, froze $80,000 of the organization's money. The group is left with only a few options for raising money now - through a Swiss-Icelandic credit card processing center and accounts in Iceland and Germany.